It was getting a little ridiculous. My friends had moved into their new house in Boulder several months ago and I still hadn’t been by to pay them a visit. Summer was pretty cray cray and fall is even more so. If not now, then when? It’s not like I’m the only person who is busy – they are busy too. Everyone is busy. I guess what makes friends so special is that an hour spent together in the midst of all the busy recharges you and leaves you with a warm fuzzy glow for several days. Their adorable baby is no longer a baby but an adorable little boy. Nichole and Luke have put so much work into their house on their own (like laying new plumbing to rearrange their kitchen – whoa!). It was really exciting for me, a DIY-wannabe, to see what two resourceful and creative DIY people can do! Then Nichole said, “Wanna see the garden?” How she finds the time to work, raise Mr. Cutiepie (my nickname for him), remodel the house, AND garden, I just do not know. All that while remaining her hysterically funny and sassy self to boot. 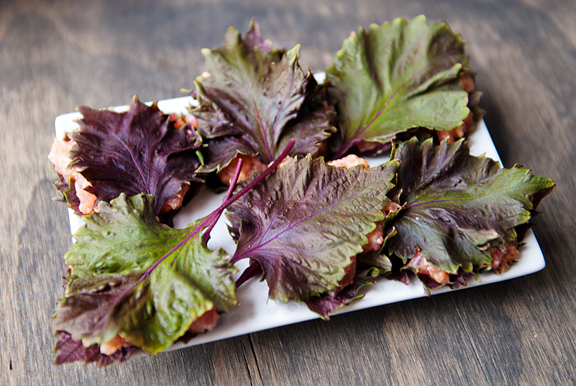 When Nichole said she had red shiso, I did a blink-blink and then a double take. Shiso? Ever since Jeremy and I went to The Lobar in Crested Butte for my birthday, I’ve been wanting to recreate the dragon scales appetizer we enjoyed. It was made with shiso leaves, and the only place I knew of to purchase shiso leaves is on the far side of Denver in Aurora (H-Mart). That’s a drive in sucky traffic that I didn’t want to make. 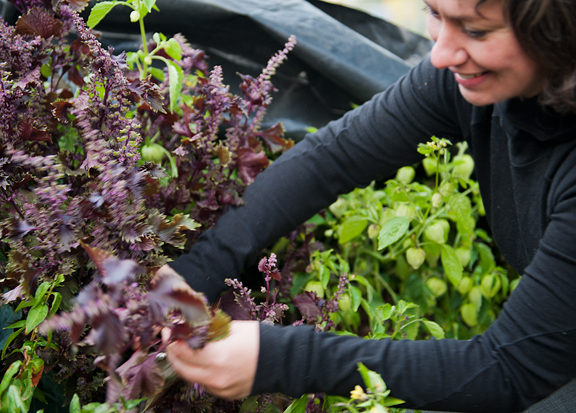 And here was my friend asking me if I would like some red shiso from her garden! Love that girl. The reason the masago (capelin roe) and togarashi (Japanese chili seasoning) aren’t in the picture is because I forgot to buy them. I wasn’t expecting to make this and scrambled at the last minute to get what I needed based on memory. But I do recommend including those in your recipe should you decide to make this (and really, you should). There are two ways you can make this appetizer. The proper way is to first tempura fry the shiso leaves, then sandwich some spicy tuna and masago between two fried leaves and season with togarashi. That’s what we had in Crested Butte at The Lobar. But, I know not everyone can deal with the raw tuna, so you can alternatively sandwich the tuna between two fresh leaves of shiso and then tempura fry the whole thing (the masago is optional). No matter how you do it, the trick to frying the individual leaves or the whole shebang is to dip and coat thoroughly, then quickly let the excess drip off and place it in the hot oil. 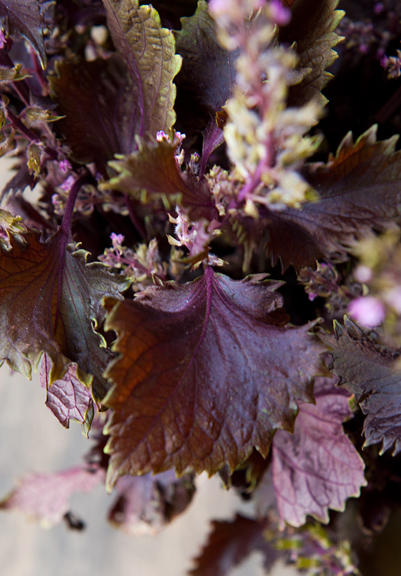 Okay wait, there is another trick if you are frying the individual shiso leaves… If you drop it in by holding the stem of the leaf, it will probably fold on itself and fry that way. Boo! But if you hold the shiso leaf by the very tip of the leaf (you may have to hold one side out from sticking to itself with the other hand) as you lower it into the oil, it tends to fry flat, which is what you want. We tried them both ways and while the cooked version was good, the raw spicy tuna version was phenomenally good! I highly recommend the raw version. This is also something you could prepare ahead of time for entertaining. 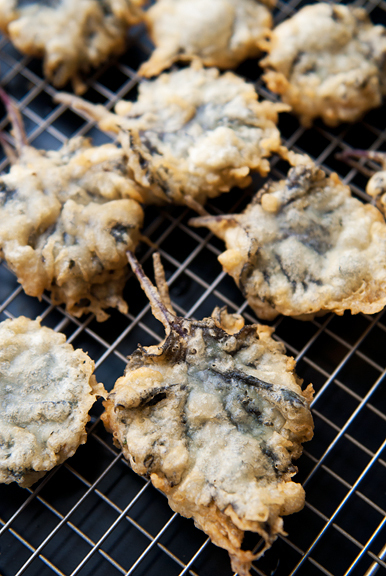 You can tempura fry the leaves and just warm them in a low oven before assembling and serving. 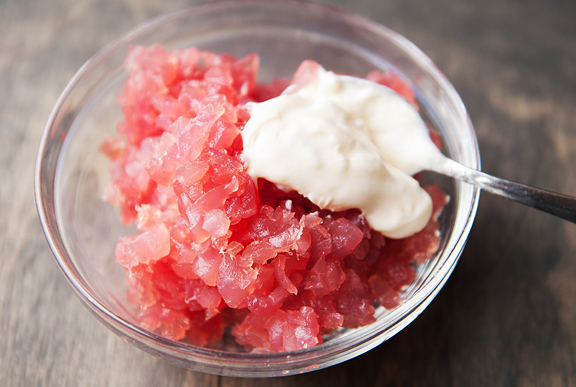 Make the spicy tuna filling: Chop the raw tuna and stir in 1-2 tablespoons of mayonnaise until desired consistency. Add sriracha sauce to taste (make this as spicy or unspicy as you like). 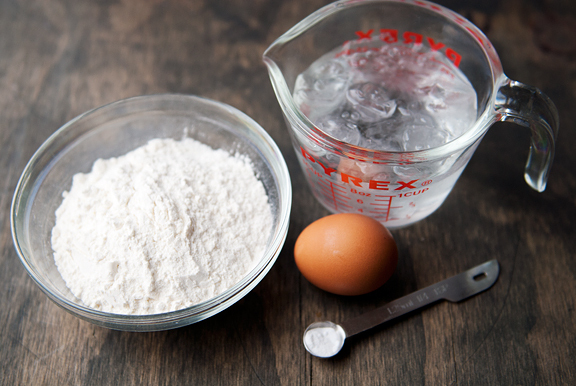 Make the tempura batter: Combine the ice water and the beaten egg in a medium bowl. 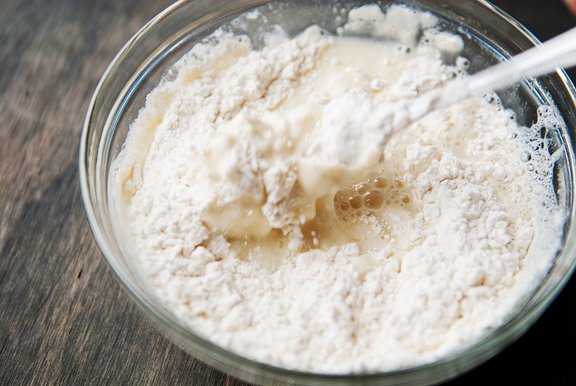 In a separate bowl, combine the flour and baking soda until blended. Pour the dry mix into the wet ingredients and stir together. It’s okay if it is lumpy. Store the batter in the refrigerator until you are ready to use it. 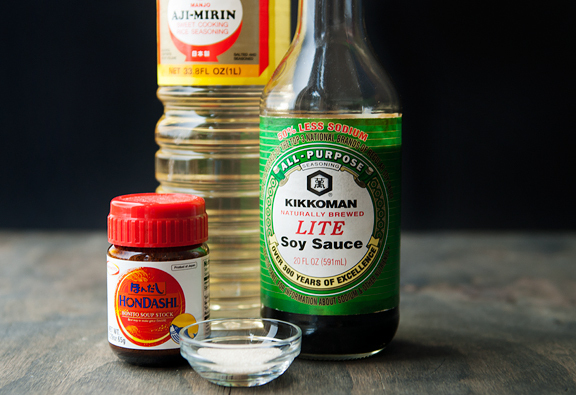 Make the tempura dipping sauce: Place all ingredients in a small saucepan and bring to a boil over high heat. Remove from heat and set aside. Frying and assembly: There are two ways to make this. The first way is to have the spicy tuna raw. The second way is to have the spicy tuna cooked. Either way, heat two inches of vegetable oil in a deep saucepan to 350°F. 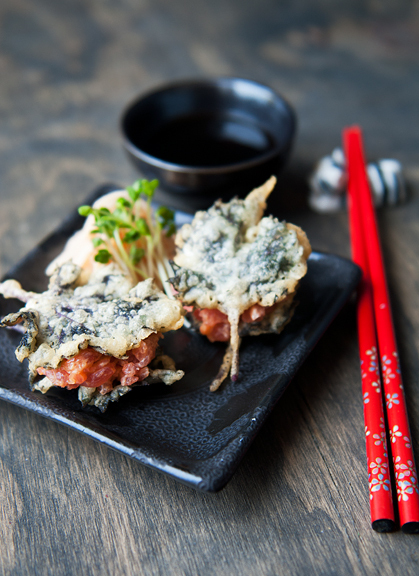 First way (raw tuna): Dip a shiso leaf in the tempura batter so it is completely coated. I find it helps maintain the shape of the leaf if you hold it by the tip (not the stem) and lower it into the hot oil. Repeat with a few more leaves, but don’t crowd them in the pan. When the batter turns a light golden color, flip the leaves and fry until the other side is golden in color. This takes less than a minute. 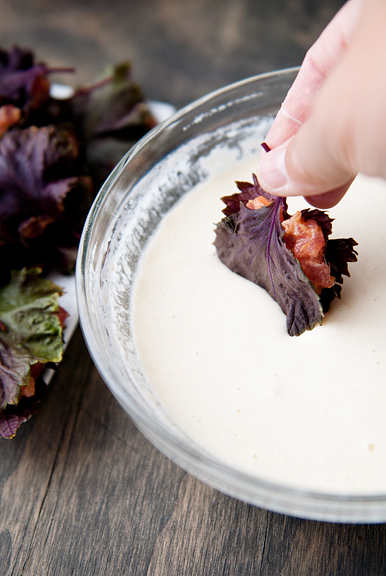 Remove the shiso leaves from the oil and set on paper towels or a cooling rack to drain. When all of the leaves are done, take one leaf and spread a tablespoon of spicy tuna filling on it. 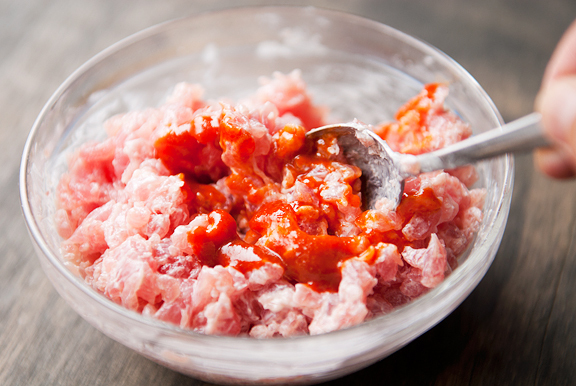 Spread a 1/2 teaspoon of fish roe on the tuna (optional). Sandwich the filling with a second tempura shiso leaf. 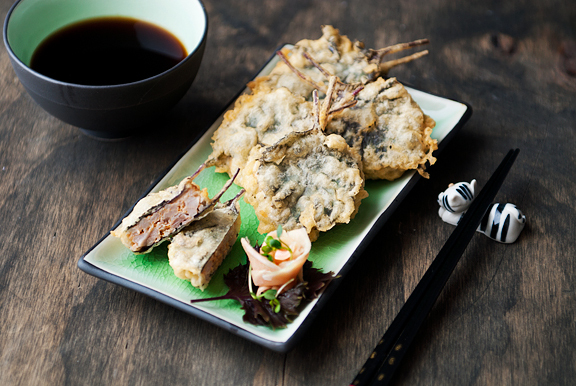 Serve with tempura dipping sauce. Sprinkle togarashi (Japanese chili pepper condiment) over the appetizers before serving (optional). 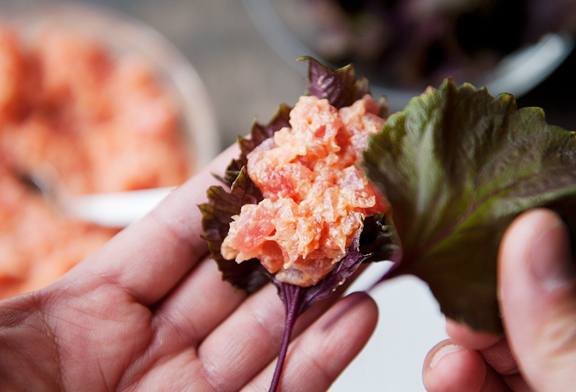 Second way (cooked tuna): Drop a tablespoon of the spicy tuna in the center of a shiso leaf. Sandwich the tuna with a second shiso leaf. Holding the sandwich by the stems, carefully dip the entire thing into the tempura batter, making sure it is entirely coated. Gently lower it into the hot oil and let fry until light golden in color. Flip and fry another 20-30 seconds. Remove to a paper towel or a cooling rack to drain. Repeat for the rest of the shiso leaves. Serve with tempura dipping sauce. Optional: Sprinkle togarashi (Japanese chili pepper condiment) over the appetizers before serving. Makes approximately 12 (depends on how many leaves you have, how big they are, and how much tuna you use for each pair). I actually like raw tuna over cooked, but, admittedly, prepping it at home is a little scary for me. This sounds amazingly good! Can I just say, that raw version looks amazing. I’m literally salivating at my screen. Love your blog, by the way! I’ve GOT to try this!! this looks amazing!!!!!! This looks so good that I’m wanting to try this as well! You ALWAYS do a beautiful job and take beautiful pics! I am drooling here! This appetizer is a long-time favorite of mine at my favorite sushi bar in Seal Beach, California, called KOI. I order it any time I am in the area. I would love to have my own Shiso plant year-round. Thank you for sharing this recipe. Mmmmm!! I love that you wrote cray-cray! Love the family photo. Cute little bugger! This is such a cool dish! I have never seen nor had such a funky tempura! Never knew you could do it this way. You raised the bar again, Jen! cindy – the trick is to have a fish monger you trust (or purchase sashimi grade tuna from a Japanese market). My Whole Foods seafood department is excellent. Lily – awww, thank you! Rocky Mountain Woman – thank you. It is *awesome*. I think it’s my new favorite appetizer! 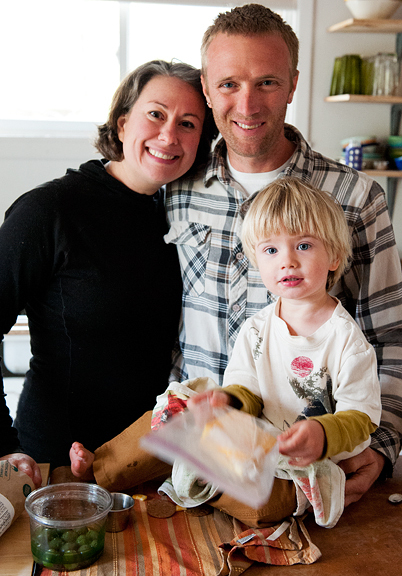 Margie – my biggest fear was parasites when I first started making sushi at home. However, finding a good and trusted source for sashimi-grade tuna is paramount. Luckily, we have one in Boulder. Just a heads up, if you live in the Pacific Northwest Region for Whole Foods, Fresh Ahi is today’s “Wednesday’s Catch”, @ $19.99/ lb. 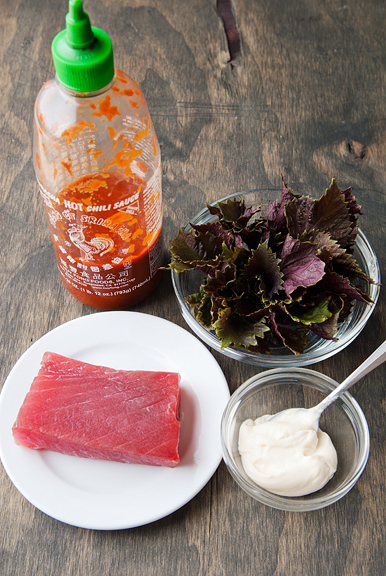 I’m from Hawaii and love the ahi they offer, beautiful color and fresh, fresh, fresh! Would you like a recipe for chiso tsukudani? Very good with hot rice. I have abundance of chiso so I try to make dishes with it.